Moscow responded to fresh sanctions placed by Washington on Monday over an alleged chemical weapons attack in the United Kingdom last March. Russian officials have slammed the United States and United Kingdom for their hypocrisy and reminded them of their own troubled past concerning chemical weapons usage. The Russian Foreign Ministry released a statement on Monday responding to the US State Department's August 8 imposition of fresh sanctions for the alleged use of the Soviet-era nerve agent Novichok in Salisbury and Amesbury in early March and late June. The lethal military-grade A-234 chemical purportedly led to the hospitalization of Sergei Skripal and his daughter Yulia on March 4, after they dined at a Zizzi's restaurant in Salisbury and were found unconscious on a park bench. The US and UK have continually insisted that Russia is to blame, without evidence or cooperating in joint investigations. US State Department spokeswoman Heather Nauert cited the 1991 Chemical and Biological Weapons Control and Warfare Elimination Act as reasoning for issuing the new sanctions. "Our country is accused of having used chemical weapons in connection with the so-called Skripal case, although no one has yet been able to provide any evidence of this, and the British side, despite our repeated requests, refuses to cooperate in the investigation of the March 4 Salisbury incident," the Russian Foreign Ministry's statement read. Moscow then highlighted many examples of Washington's refusal to participate in "the legally binding 2001 protocol on strengthening the Biological and Toxin Weapons Convention" or "[ratifying] the international monitoring system in the [Comprehensive Nuclear-Test-Ban treaty] context"
The statement also noted various times where the United States also hindered international work on legally binding agreements to prevent an "arms race in outer space," alluding to US president Donald Trump's plans to create a sixth branch of the US Armed Forces, or "Space Force". The statement points out several examples of the United States' hand in issuing, procuring, or using chemical weapons. Notwithstanding the fact that the US was the first and only country to use nuclear weapons in the August 6-9 1945 bombings of Hiroshima and Nagasaki, several other major wars have uncovered the "Made in America" trademark of chemical weapons throughout history. Battles between Iraqi forces retaking various cities and Daesh* terrorists in 2016 reignited the debate on the American military's use of depleted uranium (DU) and white phosphorous in 2004 throughout Fallujah, which occurred during Operations Vigilant Resolve, Phantom Fury, and Al-Fajr. US soldiers used DU as armor-piercing ammunition, which caused high levels of birth defects and skyrocketing cancer rates occurring from blowback smoke from soldiers firing their weapons. Germany-based Wise Uranium Project has documented extensive research of radioactive DU found in the urine, feces, and lungs of soldiers. "After [approximately] 3 years, the lung deposit is cleared, and the bones remain the organ with the largest residual uranium deposit," it stated. White phosphorous was also used as an "incendiary weapon" to terrorize local villages. Dubbed the "Hidden Massacre", US soldiers shot white phosphorous both to strike fear in the populations and incinerate victims. The US and British media simply dismissed the crimes as a "necessary war". Whistleblowing organisation Breaking the Silence released a trove of 54 soldier testimonies on the IDF's conduct during Operation Cast Lead (2008-2009). Many of them included scorched-earth engagements using white phosphorous to terrorize Gazans. Even non-lethal chemical agents such as tear gas are banned by the CWC. Whistleblowing agency Wikileaks published in November 2007 that then-US Secretary of Defense Donald Rumsfeld said he would conduct "flush out" operations in Iraq and Afghanistan back in 2003 using the substance. 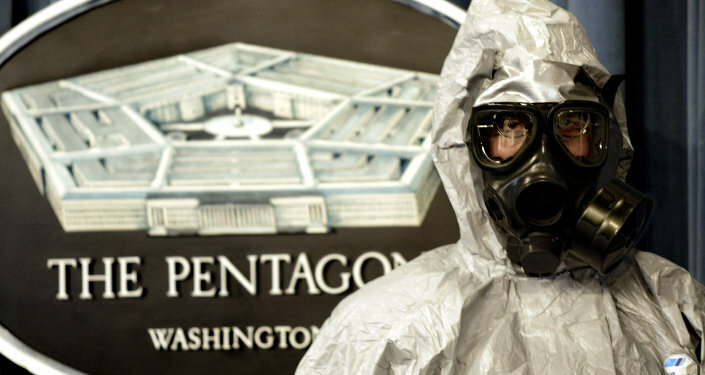 "The United States has at least 2,386 'non-lethal' chemical weapons deployed in Iraq," Wikileaks stated. The organisation also leaked the extensive list of chemical weapons they possessed there. Agent Orange is an herbicidal, defoliating chemical agent used against Communist Vietcong guerrillas in the Vietnam War. North Vietnamese villages were regularly subjected to British and US spraying campaigns operating from the Bien Hoa Air Force base during Operation Ranch Hand in 1962. The infamous Roundup manufacturer, who was ordered August 11 to pay $289 million in a California lawsuit, also produced Agent Orange as a US military contractor from 1965 to 1969. The chemical fomented unprecedented levels of birth defects and cancer across the country. Vietnamese-Canadian Phan Thị Kim Phúc was most famous for her grotesque but iconic photo depicting the horrifying realities of napalm use in the Vietnam War. ​An AP photojournalist captured her in June 1972 while she was fleeing the village of Trảng Bàng with third-degree burns on her back. The bombs had been dropped by South Vietnamese fighter pilots allied with the United States. Foreign Policy magazine reported in 2013 that declassified CIA documents implied direct US involvement in Saddam Hussein's use of nerve gas in the Kurdish village of Halabja. The former Iraqi leader also used mustard and sarin gas on Iranian soldiers four times during 1980s Iran-Iraq War, which lasted 8 years. The US directly procured the intelligence, chemical weapons, and funding for Iraq, who had not ratified the 1925 Geneva Protocol. The United States did not do so until 1975, and the CWC had not been created until 1997, the article states. "[The] Iraqis used aerial bombs and artillery shells filled with sarin against Iranian troop concentrations on the Fao Peninsula southeast of Basrah, helping the Iraqi forces win [to] recapture the entire peninsula," it said. "According to [retired Air Force Col. Rick Francona], Washington was very pleased with the result because the Iranians never got a chance to launch their offensive."